Home » Caged Element » GRIP: Combat Racing » pcreviews » GRIP: Combat Racing Review - Rollcage Revived! 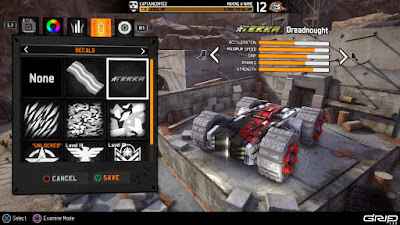 GRIP: Combat Racing Review - Rollcage Revived! Growing up, Rollcage was one of the fastest and most exhilarating racing experiences for me ever, so when I discovered Caged Element were developing a brand new combat racer, said to be a spiritual successor to the original Rollcage series, I couldn't wait to hit the track and give GRIP a test drive. Though only one question remained - Is it really Rollcage? The most entertaining hooks of Rollcage for me, was the ability to drive up walls, along ceilings and to simply explore the tracks in an attempt to reach areas not intended for the players. You see, all I had to play with back in the day was an old PC demo, but that's not to say I didn't have fun because I spent far longer on the Rollcage demo than I did playing some of the full games my dad used to bring home from his work. 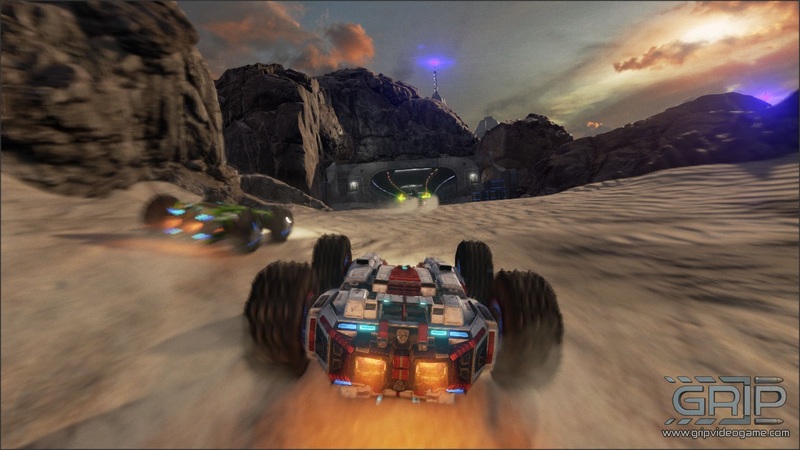 Like Wipeout, Rollcage is an aggressive combat racer where the objective is to win by any means necessary, and GRIP is no different. By picking up weapons dotted around each track, you can shield yourself from incoming attacks, gain speed boosts to get ahead of the competition, fire machine guns and even Assassin missiles to remove your rival racers from the top spot. You can also upgrade your weapons to second tier, thus increasing their destructive force and damage ratio. Though, don't be fooled into thinking you'll always have the chance to do this. GRIP is a very reactive game and you'll need the fastest of reflexes to avoid being blown up when your opponents do all that they can to reclaim their original position. GRIP is a fast game. Very fast in fact. Each car is powered by what can only be described as a supercharged Jet Engine and on average without boosts, you can expect to be traveling at nearly 400MPH. This only gets more insane as you progress further through the campaign - A series of tournaments designed to ease you into the easy races at Tier 1, readying you for the more relentless and extreme tracks of Tier 11. After this race you'll be dusting yourself off. 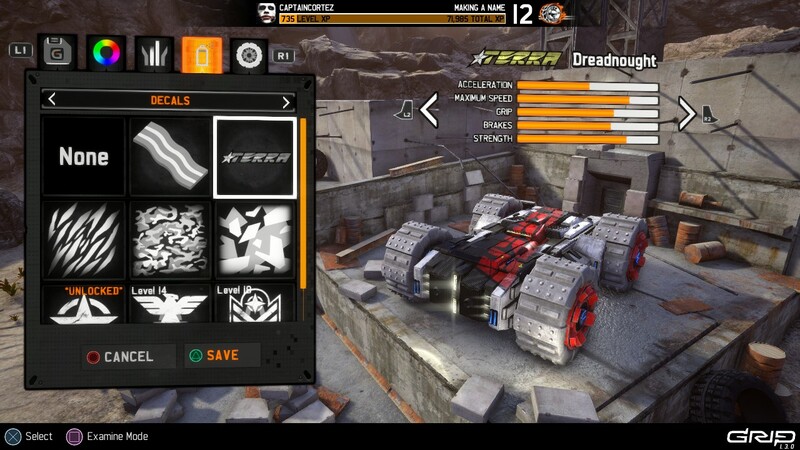 Campaign - In order to go up through the ranks, you'll need to dive into GRIP's campaign. Starting at Tier 1, you'll need to beat a number of tournaments in each tier before you can progress any further. Each tier increases in difficulty and though your eyes won't bleed, the speed does pick up incredibly fast. Though, this is quite possibly the best way to learn the basics as races are well balanced, giving you an incredibly fair learning curve. Classic Race - This is your standard race in GRIP. The objective is to win by any means necessary, utilising the many power-ups awaiting you on the tracks. For those of you who want more (or less) of a challenge, the game features four different difficulty settings - Easy, Normal, Hard and Lethal. On top of this, you can also adjust your engine power, with "Wild" being the most extreme you can get. Ultimate Race - A little different from the Classic Race, the objective of the Ultimate Race is to cause as much damage and chaos possible. This racks up the points, so it's no longer a case of needing to be in first place to win. In fact, a lot of the time you'll want to hang back to damage your opponents as much as possible, but doing this and making a podium finish also seems to impact your overall score. Elimination - This functions the same way as a Classic Race, only the car in last position is eliminated every 30 seconds, forcing you to become relentless in your assault at maintaining first place. Speed Demon - No weapons. Just pure, adrenaline filled races. Though still a blisteringly fast game, this is for the more chilled racers out there who just want to keep things simple. Arena - This is very similar to the Ultimate Race mode, only instead of racing around a circuit, all 8 competitors are pitted against one another in a fairly sizable arena. Blowing up other racers gives you a greater number of points and the racer with the most points wins. Multiplayer - All of the above modes are available in both single and multiplayer. It's common practice nowadays, but GRIP also supports private game rooms for play exclusively with friends, as well as the standard matchmaking options. World leaderboards are also in place, but the most respectable aspect of GRIP's multiplayer is the fact it supports four player split-screen, which is somewhat of a rarity on the gaming scene now. The PC version of GRIP also fully supports PS4, Xbox and Steam controllers. At these speeds even walls can't stop your advance! Time Trial - Limited to single player only, this is where you'll be setting your fastest lap times on any track of your choice, in an attempt to make it to the top of the world leaderboards! Carkour - Guaranteed to push your skills to the limit, Carkour offers a number of trick tracks to complete for those ever respectable bragging rights. The easiest way to describe this mode is to compare it to Crazy Taxi's insane stunt mode, where you have to navigate incredibly treacherous tracks to reach the end goal. Of note - I actually finished all but the last two Carkour courses in a single day. They're incredibly fun, but also equally tough and the last two (rated Nightmare difficulty) are absolutely mad. Unfortunately, with the latest GRIP update it wiped my ten hour save along with many other gamers out there. I spoke to the Brand Manager of Wired Productions about this and he said it was a known problem that only effected some of the players and though it won't help on this occasion, he assured me it wouldn't happen again. Now I'm not going to lie - I wasn't happy. When reviewing titles, we only have so long before we need to move onto the next game, so losing ten hours of play time was a heavy blow, made harsher by the fact all of my Carkour progress and customised cars had also been wiped. It left a sour taste in my mouth, but being a development issue and not so much as a problem with the game, I can't condemn GRIP to this mistake. It deserves better than that. Far better. Each car is unique, made more so by the in-game customisation. Something unique to GRIP (and previously the Rollcage series) is that you're not just limited to simply driving along the ground. 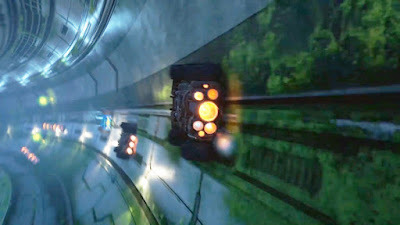 Every surface has its own gravitational pull, so when you find yourself driving fast enough to defy the gravitational force pulling you back towards the ground, you'll find yourself driving up walls, on ceilings and even looping around fully circular tunnels. There are also no shortage of ramps to jettison yourself across the map in all manner of directions, but fear not for your vehicle can drive on two wheels and even upside down. Hit a bump fast enough and you'll find yourself flying through the air with tremendous speed, in these huge tanking death machines. 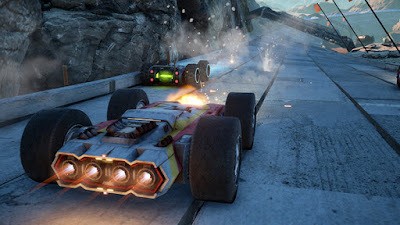 GRIP also features a degree of level destruction - You can drive through pillars, shoot explosive oil drums and on a particular ice level, even target deadly icicles to fall from the ceiling onto your opponents. It's definitely not Red Faction level destruction, but it does provide a suitable amount of chaos in this high octane racer. Running on Unreal Engine 4, GRIP has been super optimised to work on most gaming rigs. My PC is roughly 7 years old and though it can play The Witcher 3 and Nioh on High settings, by default GRIP automatically set my visuals to "Epic". Impressively, GRIP is a gorgeous looking combat racer with fairly low requirements and to give you a better idea of things, I've attached the minimum requirements below, though my rig runs with a Radeon R7 200 GPU. As you progress through the game, you're constantly awarded with experience points. 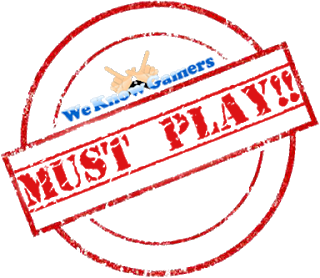 Whether you're playing with friends, completing Carkour courses or hurtling through the campaign mode, it all counts! To begin, you only have a handful of cars to choose between, but the higher your level, the more the bigger and better vehicles become available to you. Each vehicle handles differently and some will suit courses better than others - It's all about that grip (pun unintentional), acceleration and max speed. Though, that's not to say you won't find a personal favourite, for there are many varied vehicles here, each with their own unique and badass appearance, made more so with the customisation options embedded within the game. The TERRA Dreadnought is my favourite car. As you level up, it's not just cars you'll be unlocking. You'll also be able to choose between new tyres, rims, paint jobs and decals. Each of these can be modified, with decals having decent enough scaling, rotation and colour options to make your car look completely different to another on the grid. Unfortunately you can't create your own skins and there are no layer options for the decals, but they also aren't really necessary. The only two additional features I'd have liked to have seen would have been colour options for the tyres (you only have shade options ranging from black to white) and custom boost colours. Perhaps we'll see more customisation options going forward, but for now these are just minor preferences that have no impact on the game whatsoever. One additional feature I was quite happy with is the inclusion of custom soundtracks. Caged Element have made this a very simple process and removed the need to replace in-game sound files by including a dedicated folder to simply drop your tracks of choice into. Plus, if you ever want to turn custom soundtracks off and don't feel like removing all of your songs manually, there's an option in the main menu to turn the custom soundtrack off, reverting back to the more drum and bass-y feel of the tracks already included within the game (all of which is thematically appropriate). To conclude this review, building upon the DNA of Rollcage, GRIP succeeds in bringing one of the greatest racing experiences to PC yet. Aside from the previously mentioned update issues, the mechanics, gameplay, handling and sound design are solid, allowing GRIP to successfully overtake its spiritual predecessor, doing everything that Rollcage did, only better, as it succeeds in wheeling its way to a modern audience, as one of the most thrilling, adrenaline-pumping and entertaining combat racers to date. You'd be a fool to skip this! GRIP: Combat Racing is out now for PC, PS4, Xbox One and Nintendo Switch. Had a chance to play GRIP yourself? Got something you'd like to add? Then let us know in the comments below or hit me up on twitter @CaptainCortez.